If you have not yet been introduced to Metal Blade Records: Barn Burner's debut release "Bangers" I strongly suggest giving it a listen. 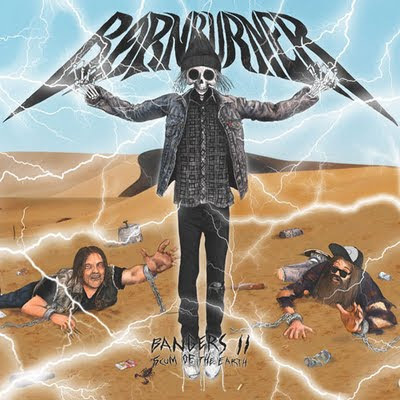 While Barn Burner caught our attention here with the 2009 release "Bangers", their latest "Bangers II: Scum of the Earth" has pushed BB ever closer to a top band here at HP. Where the first record was jammin' and catchy, it became very repetitive. Don't take this the wrong way, it was still a very solid album, but with "Scum of the Earth" the band has become more versatile and almost progressive melding their already groovy stoner rock with early thrash and maybe even some NWOBHM (thinking dueling guitars like Iron Maiden). Upon first listen, comparing to the freshman release, you will notice a much cleaner production. The production alone brings a new heaviness to BB. "Scum of the Earth" sounds crisp, yet just a gritty as "Bangers". Lead singer, K. Keaglesmith, brings new diversity in his vocals with SotE. Still heard is his crooning now infused with more aggressive shouts. The bond between vocals, guitar licks, bass lines, and percussion is extremely well orchestrated, for the style of music. Our title track is also our intro track. "Scum of the Earth" wastes no time getting to the point of everything BB is. An overwhelming flow of groovy tones hit you, and you immediately realize that "Bangers" wasn't just a fluke of solid tune, SotE does not disappoint. The last twenty seconds will have your heading banging and singing along "We all die sometime!" "Gate Creeper" may very well be my favorite track on SotE. There is such great harmony here, to the level of early Swedish death metal (At The Gates). "Gate Creeper" is relentless, just up until the final minute where most instruments drop out, leaving only Keaglesmith's guttural moan, thin bass line, and keyboard. "Keg Stand and Deliver", with a title like this, how can't we enjoy. BB kicks things off anthem style with a menacing guitar driven jam-fest and lyrics, "You've seen your future in a bottle". I wonder if this is a party tune... "Come with me, lets go... I don't want to raise hell alone!" "Crushing Defeat" is a pummeling victory. The intoxicating lick commands head banging, whether the listener is in the mood or not. Once we're stuck in the pull of the guitars, cymbals crash, the only thing to do is flail turbulently. "Ghost Jam" begins as a catchy acoustic ditty only blast into a stoner charged blues tune, and an exceptional outro to an exceptional follow up album. Barn Burner is one of the few bands that has found the perfect composition of polished and raw behind their sounds and song writing. The feel is gritty and dirty, but the tunes are polished and loud. I liked "Bangers", I love "Bangers II: Scum of the Earth". I'd say the stock at Metal Blade is going up, thanks Barn Burner. I give Scum of the Earth an astounding 9 out of 10. If you enjoy this, check out Bison B.C.